The painting is powerful and difficult to look at. 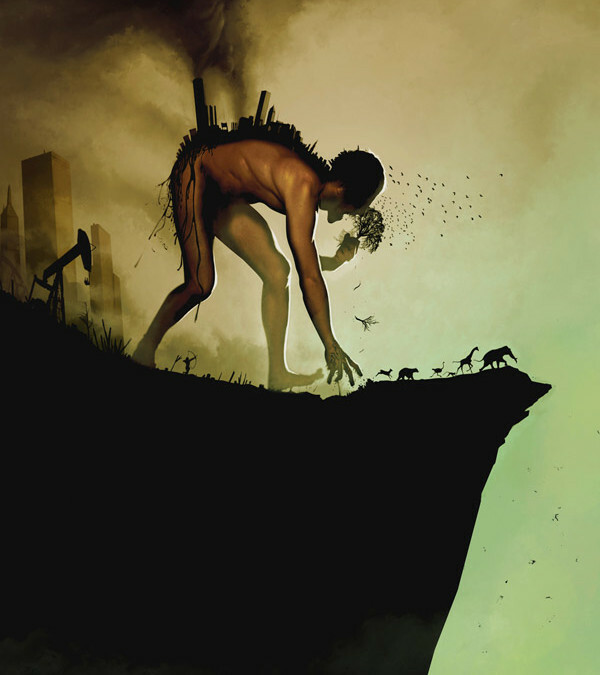 It portrays mankind as voracious, devouring the resources of the planet, leaving little behind but destruction. Natural resources that might have sustained a few hundred million, or perhaps even a billion, have been plundered in the space of a few short decades, at the expense of thousands of extinct species, collapse of the ocean ecosystem, and looming weather disruptions that will see us all end up over the edge of that dark cliff if we’re not careful. It’s an incredibly dark and stark image. But we need this shakeup; not just a shakeup, we need a revolution. Will we get up off the couch and revolt? Even Pope Francis agrees we need a revolution to solve the bind we find ourselves in, to change the system deeply enough to avert disaster. Does this terrifying image scare you enough to join a revolution? For more about Insatiable, follow Theodore Bolha’s blog: http://theodorebolha.tumblr.com/search/insatiable. For more about Climate Change, Capitalism and Corporations, check out the web site: https://creativeselfdestruction.wordpress.com/. For more on Pope Francis and his views on Climate Change, check out this Democracy Now segment on his recent encyclical: http://www.democracynow.org/2015/6/18/pope_francis_bold_cultural_revolution_needed. Thank you, and I want to be clear that am optimistic about our species – it’s also good to know this image strikes people as it does. That means they can’t help but hear it. Thank you Theodore, and for this amazing image! 2015 seems to be a year in which a lot of people starting “getting it”; perhaps the drought and heatwaves and other disruptions are finally sinking in… that is an encouraging sign. with this sort of Energy around we may be getting somewhere.